AUGUSTA -- Former independent gubernatorial candidate Eliot Cutler may take the first step toward a second bid for the Blaine House later this week. AUGUSTA — Former independent gubernatorial candidate Eliot Cutler may take the first step toward a second bid for the Blaine House later this week. “I’m going to do something this week,” Cutler said on Tuesday. He said there would be no formal announcements or press conferences, but he declined to provide additional details. Cutler was responding to rumors that he planned to make an announcement about his candidacy. The Cape Elizabeth resident declined to comment further, but his remarks suggest that he may announce the formation of his campaign committee, a required preliminary step for gubernatorial candidates. Cutler’s move coincides with the release Tuesday of a poll by Public Policy Polling, a national firm, showing that Gov. Paul LePage is among the least popular governors in the country, yet he would likely finish first in a three-way campaign involving Cutler and various Democrats. The poll release and rumblings of Cutler’s announcement touched off early salvos from potential opponents. Brent Littlefield, who is involved with LePage’s re-election committee, said Cutler has been campaigning ever since he lost to LePage in 2010. Democrats, meanwhile, said the PPP poll showed that Cutler would be a spoiler. Cutler has long been regarded as a likely Blaine House candidate in 2014. If he announces the formation of a campaign committee, it does not guarantee that he will run. However, the step enables Cutler to begin raising money. Jim Melcher, a political science professor at the University of Maine at Farmington, said Tuesday that at first blush it may seem early for Cutler to initiate his campaign. He said Cutler may be trying to capitalize on a news cycle that has been dominated by state and national politics. Additionally, Melcher said, forming a campaign committee doesn’t lock in Cutler to running again, but creating one early may have some strategic value. The re-election committee for Republican Gov. Paul LePage was formed in August of 2011. LePage’s campaign committee has held several fundraisers since then and has become more active over the last couple of months. LePage, who narrowly defeated Cutler during a five-way race in 2010, has not formally announced that he’s running for a second term. Cutler lost to LePage by 1.8 percentage points in 2010. It was a stinging loss for Cutler, who blamed early voting and other factors for the defeat. Cutler, an attorney, was born and raised in Bangor. He has not held elected office but was the assistant director of national resources and energy for President Jimmy Carter. Prior to that he was a legislative assistant for former Democratic U.S. Sen. Edmund Muskie and was involved with the drafting of the Clean Water Act and the Clean Air Act. He later headed a national environmental law firm that eventually folded with the international firm Akin Gump, one of the most prolific D.C. lobbying organizations in the country. 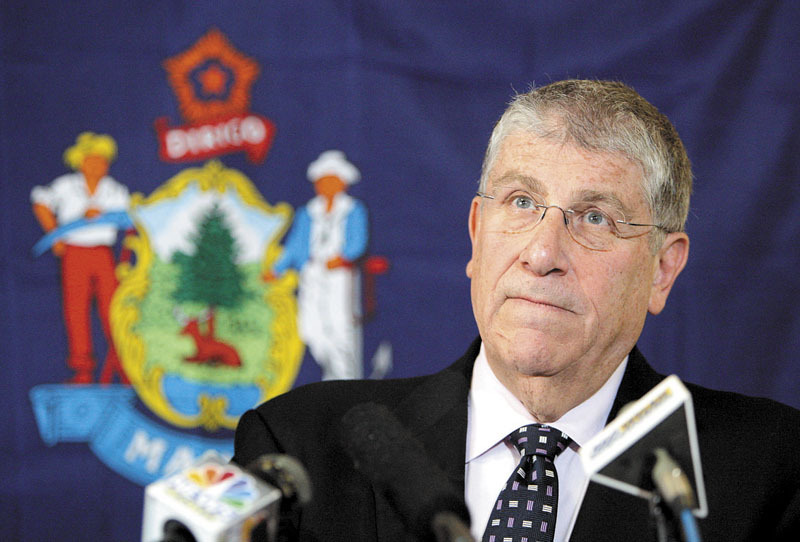 After his 2010 loss to LePage, Cutler vowed to remain politically active and established OneMaine, an offshoot of his former campaign apparatus that is designed to support independent candidates and claims not to be a “stalking horse” for Cutler himself. Cutler has also remained in the public spotlight, making weekly appearances on local radio shows. He was also a board member for Americans Elect, a national, nonprofit group originally formed to achieve ballot access in every state for the purpose of introducing a bipartisan presidential ticket. That presidential push fizzled, but Americans Elect resurfaced during the U.S. Senate race when it spent over $1.3 million to help elect independent U.S. Sen. Angus King. Americans Elect’s involvement drew complaints by Republican operatives, who claimed that the group illegally coordinated with King’s campaign. The complaint centered on Cutler, who was the chairman of King’s state campaign. Cutler later produced a letter showing that he had resigned from Americans Elect prior to its becoming involved in the senate race, but that letter has not pacified skeptics. Rumors about Cutler’s formation of a campaign committee follow increasing speculation that former Democratic Gov. John Baldacci is weighing another run at the Blaine House. Baldacci reiterated last week that he is considering a bid in 2014. He did so after offering pointed criticism of LePage’s governing style during an event held in Bangor. Melcher, the UMaine professor, said Tuesday that there may be a strategic reason for Cutler to get involved in the race early. He said his announcement could influence decisions by Democratic candidates, removing some challengers from the field. “It’s like they say, the best opponent is the one that doesn’t run,” Melcher said. Other than Baldacci, no other well-known Democrat has expressed interest in running for governor. Ben Grant, chairman of the Maine Democratic Party, told the Press Herald in December that the party would welcome the candidacy of either U.S. Reps. Mike Michaud or Chellie Pingree. Ed Gilman, Michaud’s spokesman, said the congressman was focused on his work in Washington. “Anything with respect to the gubernatorial race he’ll consider in due time,” Gilman said. Pingree is married to S. Donald Sussman, the majority owner of the Portland Press Herald/Maine Sunday Telegram and MaineToday Media newspapers. Steve Woods, a Yarmouth town councilor and a former independent candidate for the U.S. Senate, announced in November that he was rejoining the Democratic party for a potential bid at the Blaine House. Woods is considered an outsider in the Democratic party, but has attempted to make inroads and elevate his profile since his November announcement. Grant told the Press Herald in December that the party will run “a serious, well-financed campaign” no matter who runs for governor in 2014. “We’re not backing down from any challenge, whether it comes from (Gov.) Paul LePage or (presumed independent candidate) Eliot Cutler,” Grant said. Implied in that declaration is an admission that Democrats settled for third in this year’s U.S. Senate race because they feared a repeat of the 2010 governor’s race. That contest went to LePage after Cutler’s late surge siphoned votes from Democratic candidate Libby Mitchell, who finished third. Republicans attempted to replicate that outcome during the 2012 U.S. Senate race, when outside GOP groups ran ads attempting bolster Democratic candidate Cynthia Dill. Dill finished third in the race. Grant has said Democrats will conduct polling to help determine who is the best party candidate. On Tuesday, Public Policy Polling, a national firm, released a poll that showed LePage was one of the most unpopular governors in the country, with 39 percent of respondents approving of his performance against 55 percent who disapprove. Littlefield disputed LePage’s approval numbers. Even if taken at face value, he said, the numbers showed that the governor had built strong levels of support despite difficult budget challenges. PPP also polled potential gubernatorial races. In each one LePage comes out on top. Cutler finishes second in all but two of the scenarios. One shows LePage with 34 percent, Michaud with 30 percent and Cutler with 26 percent. Another shows LePage with 37 percent, Pingree with 31 percent and Cutler with 23 percent. A third shows LePage with 36 percent, Cutler with 29 percent and Baldacci with 27 percent. Grant said the results showed that Cutler would only be a spoiler. PPP surveyed 1,268 Maine voters and 510 usual Democratic primary voters between Jan. 18 and Jan. 20. The margin of error for the entire poll is 2.8 percent and 4.4 percent for the Democratic portion. PPP surveys are conducted through automated telephone interviews. The firm said that the Maine poll was not commissioned by any political party or organization. Critics of the firm — including Littlefield — have said that PPP results skew toward Democrats, a claim linked to the firm’s Democrat-heavy client list. Nate Silver, a statistician for the New York Times, found that PPP had a 3-point Democratic bias in its surveys of the 2010 congressional races. However, Silver calculated that PPP presidential polling skewed toward slightly toward Republican candidate Mitt Romney.